Dublin (AFP) - Hundreds of employees walked out of Google's European headquarters in Dublin on Thursday as part of a global campaign over the US tech giant's handling of sexual harassment that saw similar protests in London and Singapore. 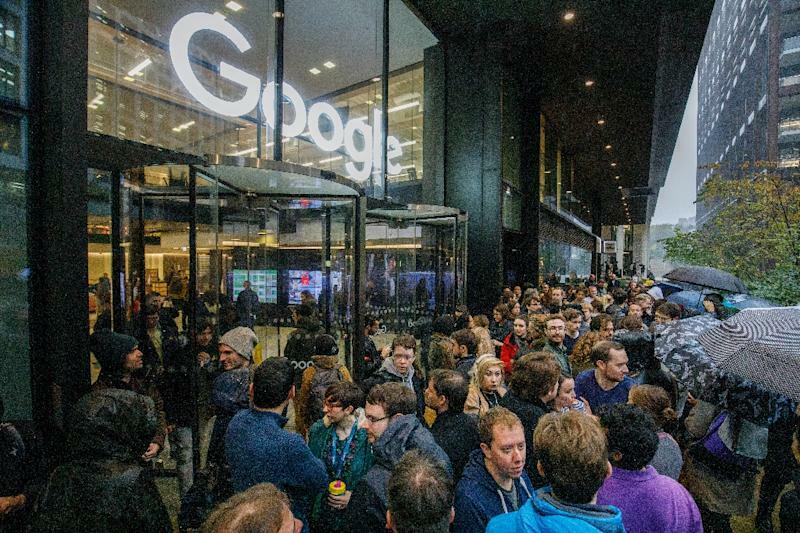 At Google's Dublin campus, around 500 people walked out in chilly conditions but were reticent about speaking to the media. Organiser Kate, who did not want to give her surname, told the crowd that she coordinated the Dublin walkout "in solidarity with anybody who has experienced any form of sexual harassment or misconduct in our workplace". She told reporters afterwards: "If even one person has experienced it, it's important for us -- for me -- to show our solidarity and say that we don't agree with that, and that it shouldn't happen." Google said last week that it had fired 48 employees in the past two years -- including 13 senior executives -- as a result of such allegations, citing "an increasingly hard line" on inappropriate conduct. "I think we all feel the same way: supporting colleagues who have been harassed and making sure that this never happens again." Google's management had been "very supportive" of the walkout, he added. Another Google worker, Anna, who did not want to give her full name, told AFP they were making a point about "power structures" and telling their leaders that "things are changing and it's time to revise what used to be considered as normal". In Singapore, dozens of employees gathered in an indoor space at Google's offices, with a picture of the gathering posted on the "Google Walkout for Real Change" Twitter feed. The Google Walkout account said there were also walkouts in Tokyo, Zurich, Berlin and Haifa in Jerusalem. The walkout call came as Google's parent company Alphabet confirmed Wednesday that Richard DeVaul, an executive accused of sexual harassment, left the company without an exit package. Pichai said he has heard from many employees on the subject of inappropriate behaviour at work and was "deeply sorry for the past actions and the pain they have caused employees". Google released an email from Pichai to employees stating that none of the people who resigned or were fired due to sexual harassment concerns in the past two years received "an exit package". "We are dead serious about making sure we provide a safe and inclusive workplace," Pichai said in the email sent last week.